As well as there being a full moon tonight - reaching its fullest at around 8.45am in London time tomorrow, Saturday 15 April - there is also a total lunar eclipse. It is the first of two total lunar eclipses in 2014 and is the first of a tetrad, meaning four total lunar eclipses in series. 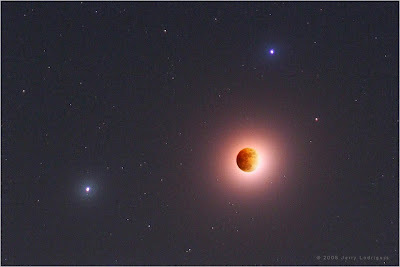 While some fundamentalist Christians are saying that this series of four lunar eclipses - also known as "blood moons" because the celestial body takes on a red hue - heralds the End of Days, I think that's just as unlikely as any other end of the world prediction we've so far survived. If you are interested in reading more about the prophecy though, here's a link to a news story in the Express. However, if you are into scrying and other types of divination, lunar eclipses are a good time to have a go. The energy of the blood moon can also be used for magical rituals and spells for personal transformation. As Mani Navasothy of Pagan Frontiers says in his book The Eclipse Magic Workbook, "Eclipses offer us unique and sometimes rare opportunities for doing special magical or psychic work that can be lifechanging." If you want to make a big change in your life, now is a good time to make a start. Today, think about what transformation you really want, whether that is a new job, a change in a relationship, a house move or embarking on a new spiritual path. Then, at the time of the eclipse, write down your intention on a slip of paper as a promise to yourself. Fold the paper up and put it into your wallet or purse to keep with you at all times until the change manifests itself. Those in eastern Australia, New Zealand, the Pacific, and North and South America will get to view the lunar eclipse fully, while in London we might be able to glimpse a penumbral eclipse at 5.55am, just before dawn.